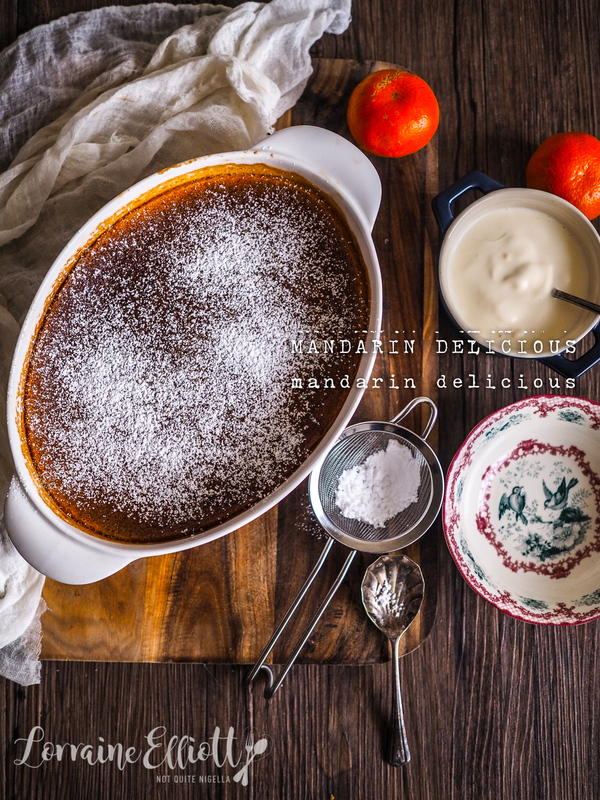 Mandarin Delicious is a gorgeous floral version of a lemon delicious, a two tiered souffle-like pudding that makes the most of seasonal citrus fruit. I recently had a bag of mandarins in my kitchen that never seemed to end. They were tiny, a vivid orange, almost scarlet and no matter how many I stuffed in Mr NQN's lunch, the bag never seemed to end. I dislike it when stuff goes to waste so I managed to use up a lot of them with this mandarin delicious. The texture of this pudding is so light and fluffy and it splits into two layers. It only needs some cream or ice cream to pair it with. Speaking of things in my kitchen, the series hosted by Sherry where we show you fun and interesting items, I've got a few curiosities to show you. The first item is something that I've been playing with. While the world seems to love matcha, there is another tea that is becoming popular. It's matcha's cousin hojicha which is lower in caffeine and is a green tea that has been roasted over charcoal (rather than steamed) and the roasting process gives it an reddish brown colour. I actually prefer it to matcha which can be an acquired taste. 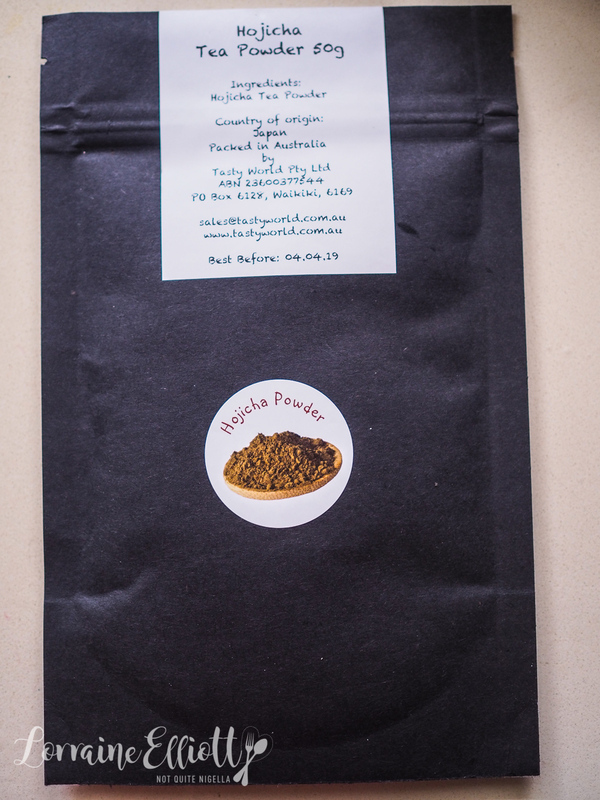 Hojicha is nutty (as opposed to the grassiness of matcha) and delicious and much more taste accessible, especially if you like flavours like nuts or sesame. The next two items were bought on a shopping and eating spree out west with my sometime vegetarian friend Laura. 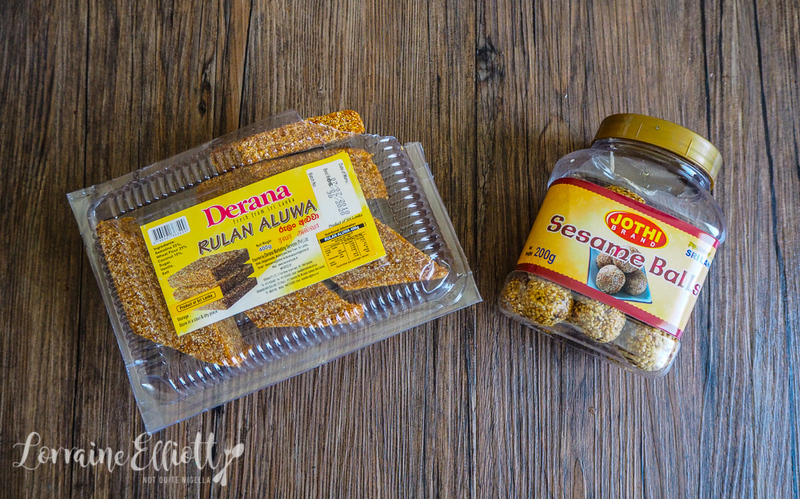 We stopped by a store and asked them to recommend some Sri Lankan sweets because while we both know and love Indian sweets, Sri Lankan ones are a bit less familiar to us. On the left is a dense semolina sweet - sort of like a sesame snap but less crisp. And on the right are sesame balls, like sesame snaps but in ball form. Both were good but I especially liked the crunchy, sweet sesame balls. Ever since trying salted egg chips I've been trying to track more down as they're really addictive. 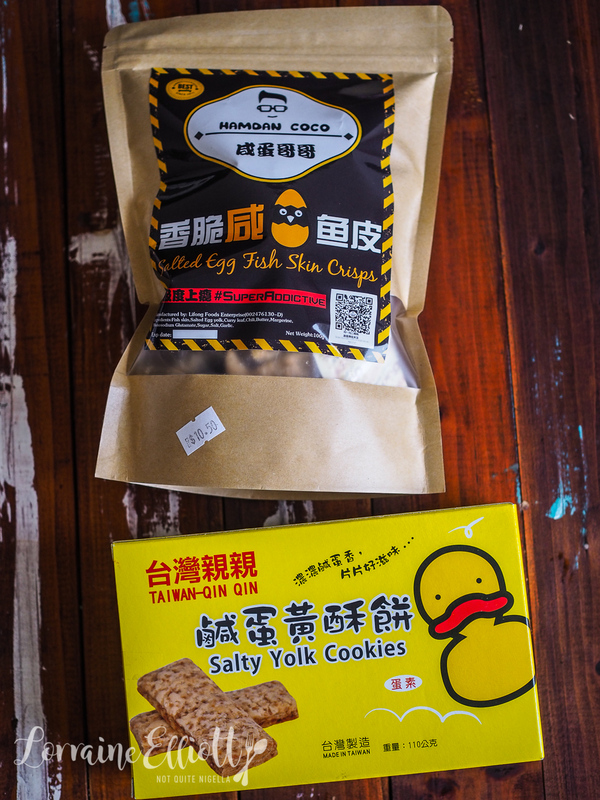 I found some salted egg fish skin at an Asian grocery store. The chips I'm sad to report were stale and not crunchy (and not inexpensive at $10.50 a bag) even though they weren't out of date so I don't recommend those. But the salted egg yolk cookies were delicious! Salted egg is like the Asian version of parmesan so these cookies reminded me of parmesan cheese cookies-very moreish! The last item I bought because they were near the salted egg fish skins. I know fish skin chips might not sound like the most delicious thing on earth and maybe it's an Asian thing because my Caucasian friends have not like these. These ones were flavoured with black pepper and were really nice and crunch-if only they did a salted egg version! So tell me Dear Reader, would you give fish skin chips a go? Have you ever tried hojicha and if so, what do you think of it? And do you like delicious puddings? 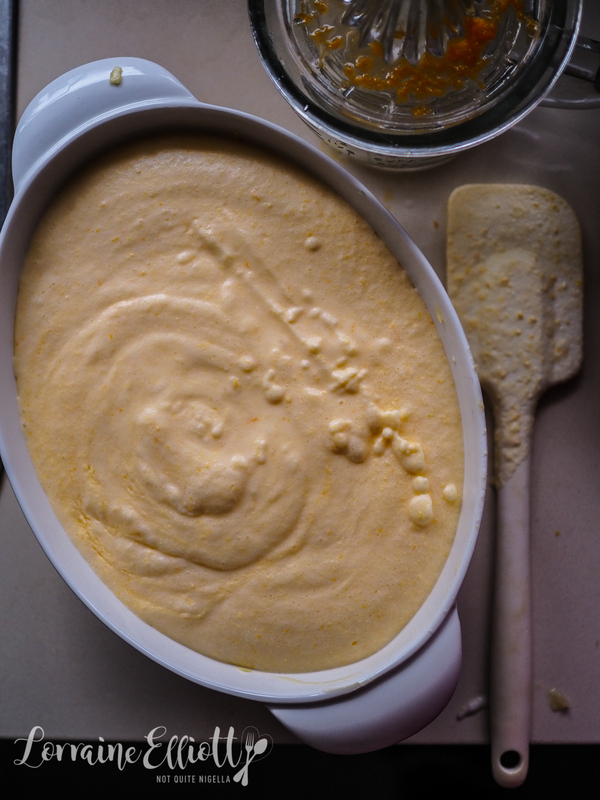 Step 1 - Grease a baking dish with butter and preheat oven to 180C/350F and put a kettle of water onto boil and have a large baking tray that will be serve as a water bath ready. Separate the eggs making sure that there is no yolk in the whites. Make sure that the mixing bowl and whisk are very clean and then whisk the whites with cream of tartar until soft peaks form. Then add the 2 tablespoons sugar and whip until you get stiff peaks. Transfer to another bowl. 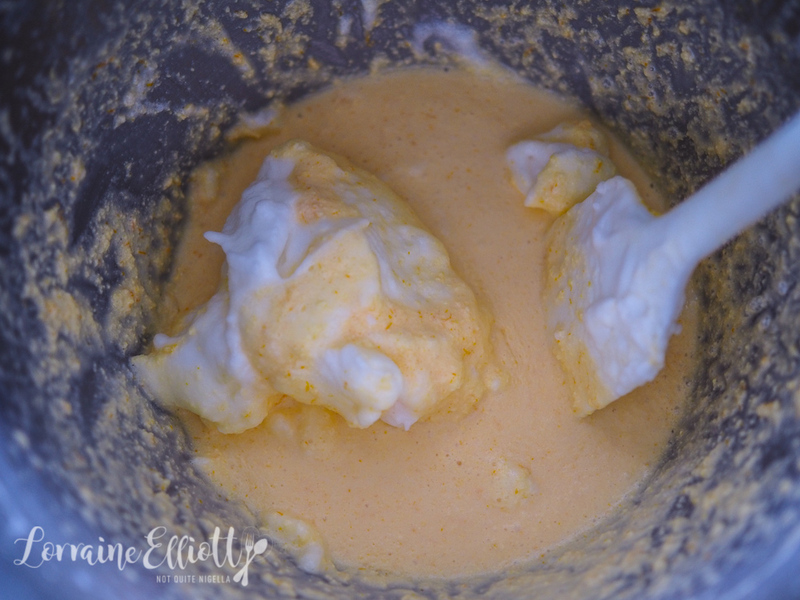 Step 2 - Whisk the butter and 1/4 cup of sugar together until pale and then add the egg yolks and whisk until fluffy. Add in the zest, juice and baking powder and whisk until smooth. Add the whipped egg whites in three lots and milk folding well until the white streaks disappear. Scoop into the greased dish and place in a water bath and bake for 40 minutes or until the centre springs back when touched. Step 3 - Dust with icing sugar and serve with cream or ice cream. 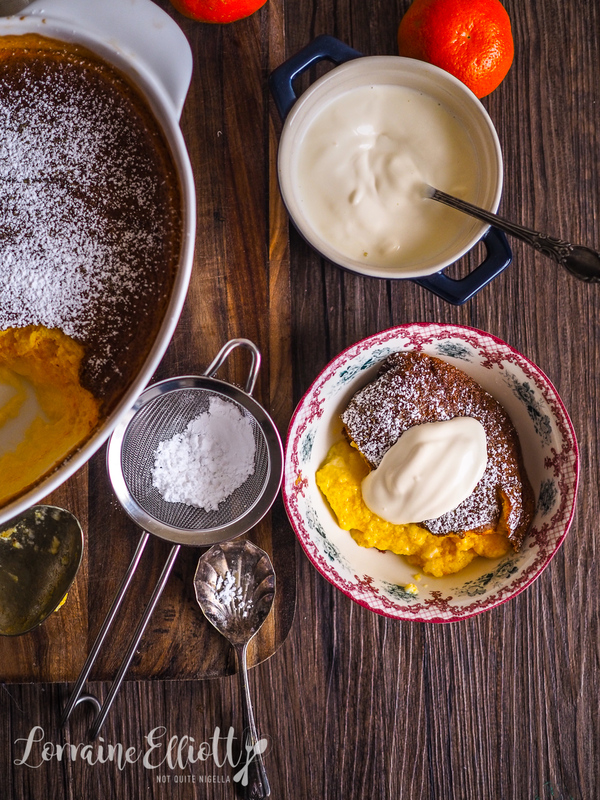 recipeLuscious Quince & Apple Golden Syrup Self Saucing Pudding! 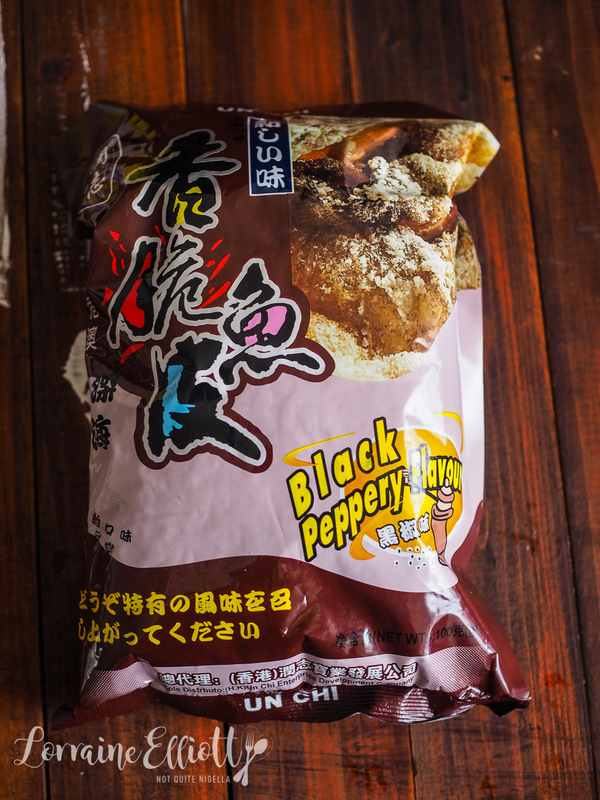 recipeSuper Snackage: Peking Duck Popcorn! recipe Luscious Quince & Apple Golden Syrup Self Saucing Pudding! recipe Super Snackage: Peking Duck Popcorn!